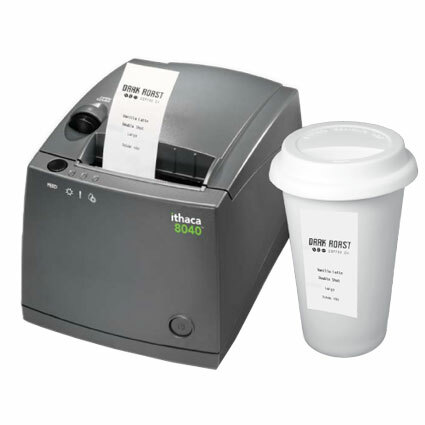 The Ithaca 8040 receipt printer makes scribbling orders on cups or wrappers a thing of the past. At 40 mm (1.57") wide, the 8040´s receipts use an adhesive backing to ensure proper adhesion to orders, promoting accuracy and eliminating order errors. The 203 dpi printhead gives crisp and sharp printouts at a snappy 6" per second, fast enough to keep orders moving efficiently. To ensure a long lifespan, the Ithaca 8040´s main PC board is vertically mounted, allowing water to channel through the receipt printer without settling on the circuitry. 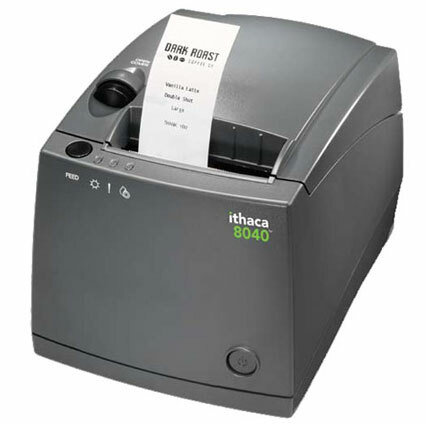 Durable components, including a printhead rated at 62 miles of receipts, ensure the Ithaca 8040 printer will give your business many years of excellent service.